Vanitas is a series I hold really dear to my heart. The whole theme of futility of pleasure and certainty of death has always spoken to me, and so when designing the setup we wanted to go all the way using some of the classic vanitas symbolism: peeled lemons, flowers, musical instruments, skulls and much more. Even though the theme was so strong it didn't really define any details of the costuming so I had all the artistic freedom. I knew it should be something rich in color, accentuating the model's youthful appearance. Pier Francesco Cittadini. It's easy to be inspired when the mood board material looks like this. 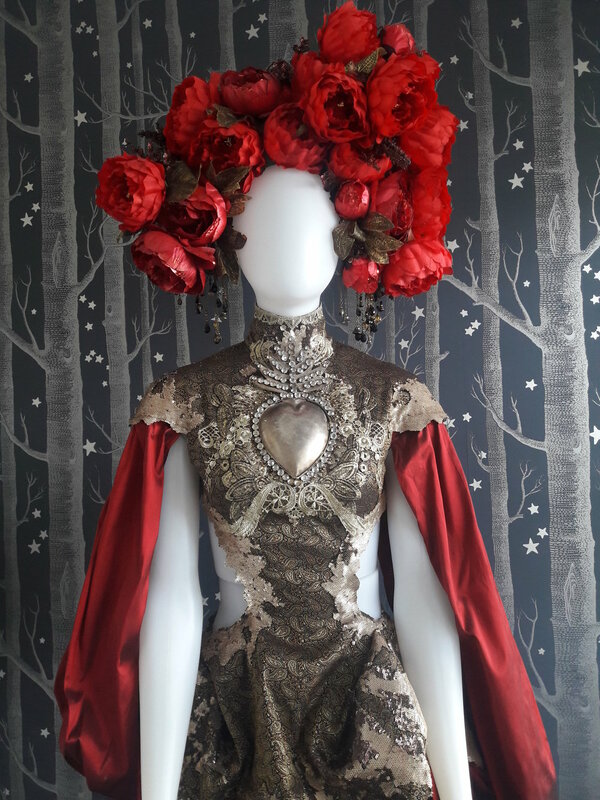 Floral headpiece I made for this is at the same time very big but also surprisingly simple. I have a tendency to stack everything together and really go for it with materials and textures but this time I managed to not get too over the top with everything. Just a simple crown of dark red peonies assembled somehow asymmetrically. A huge amount of peonies to be clear. I was so excited and in a creative hurry to make it I used one of my gold leather thorn headpieces as a frame, a hasty decision I now regret. But I promised not to destroy or take apart these newer pieces so I guess it's going to stay like that... Those dangling chains and beads are from the old piece underneath and I let them be as they looked so good with the dress. I really enjoy working with little jewellery parts and beads, it's very calming to tinker with small pliers for hours on end. This one's one of my favorite costumes I've ever made and it's not so simple to pinpoint why. Maybe it's the gold tones combined with dark red, or just the memory of building the set with Mikaela and adding tons of fresh fruit, beautiful fabrics and all the gorgeous vintage items from Mikaela's collection. After this I've also been somehow obsessed with high collars and small cap sleeves, there's something interesting with that clean silhouette mixed with rich embellishments. I hope I'll be able to return to this style later, even though we're so so so very busy with all our new concepts I don't know when that'll be.